Description: Helpers 3349 & 3357 head east to assist their next train. Description: The rear of an eastbound stack train as seen from Amtrak. Description: Two light engines fly past this eastbound mixed freight as it grinds upgrade. 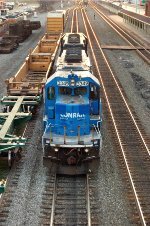 Description: Four SD40-2's assist an eastbound loaded coal train through Cresson, PA. Description: Four SD40-2's assisting an eastbound loaded coal train through Cresson, PA. 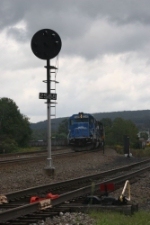 Description: The same all blue helper set we saw in Altoona passes through Cresson.